Bidding was fierce at Grosvenor in two auctions held over three classic days between March 5th and 7th. A ‘Du Pont Factor’ added further charisma to items already rare and desirable, contributing to a series of exceptional results. 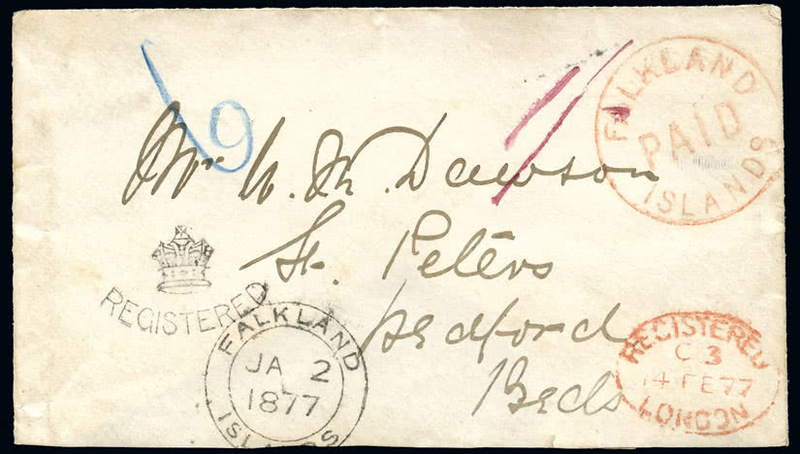 The much-anticipated auction of the JOHN E DU PONT FALKLAND ISLANDS attracted a large attendance, many staying after the conclusion to enjoy a remarkable display of complementary Falklands material presented by prominent members of the Falkland Islands Philatelic Study Group. This was a memorable day for collectors of the islands who came to see rarities that may appear for sale only once in a collecting generation. 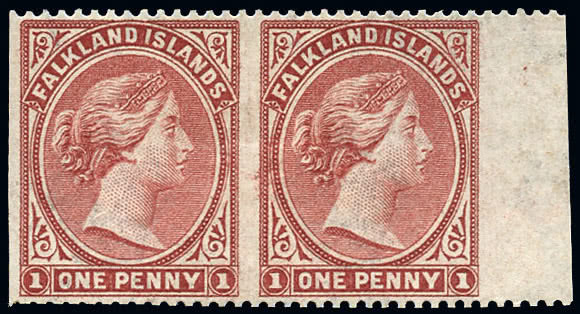 The auction achieved an overall total of £548,400, more than double its pre-sale estimate with those attending witnessing a new world record for the sale of a Falkland Islands item when the front cover item, one of just two known pairs of the 1882 1d. imperforate vertically (lot 2036, left) rose to sell for a highly impressive £58,500. 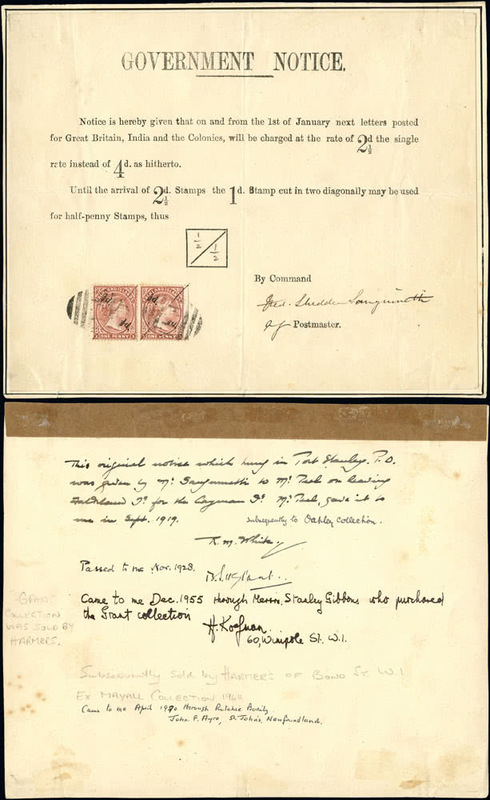 The record was to last for less than hour, however, when it was further shattered by the extraordinary £106,590 paid for the magnificent mint block of thirty of the 1928 South Georgia provisional surcharge including one stamp with surcharge double (lot 2149, above). 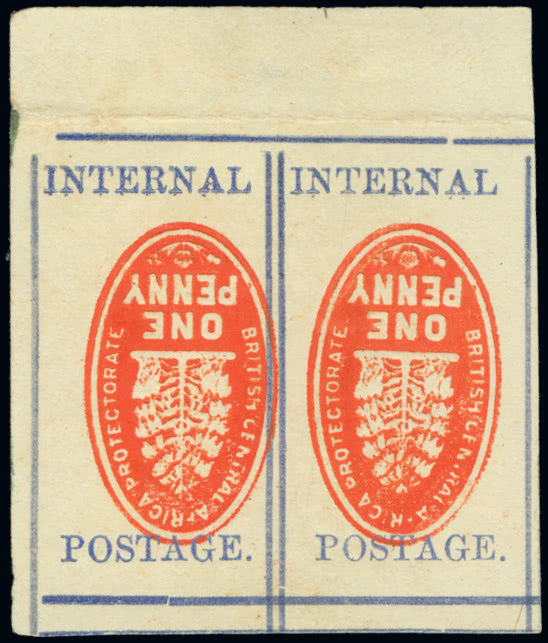 Among other notable realisations, the 1891 Government Notice for the Bisect Provisionals (lot 2047), one of three known, was strongly contested upward to £19,305; a particularly attractive example of the Red Frank on cover (lot 2009, left), the second earliest example, achieved £20,691; and the largest recorded example of the 1879 4d. 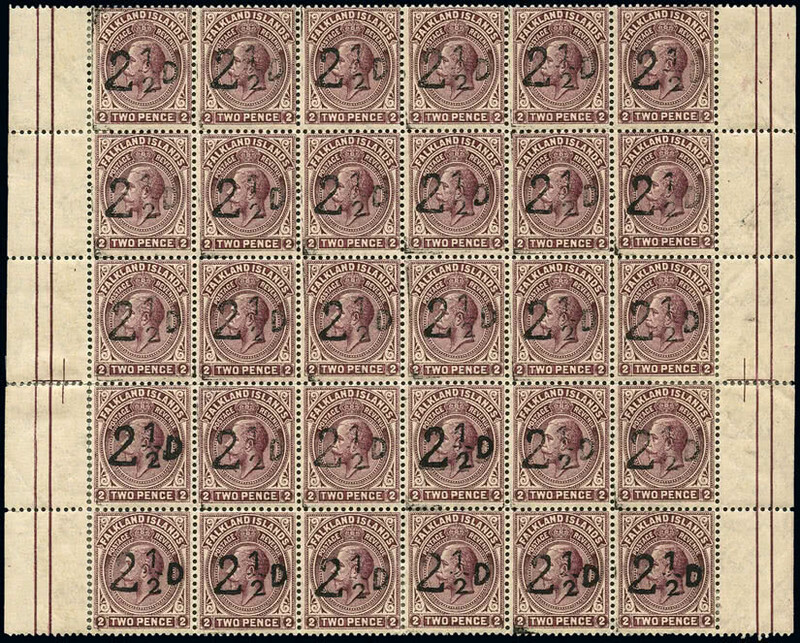 (lot 2031), a block of twelve, rose to £15,795. 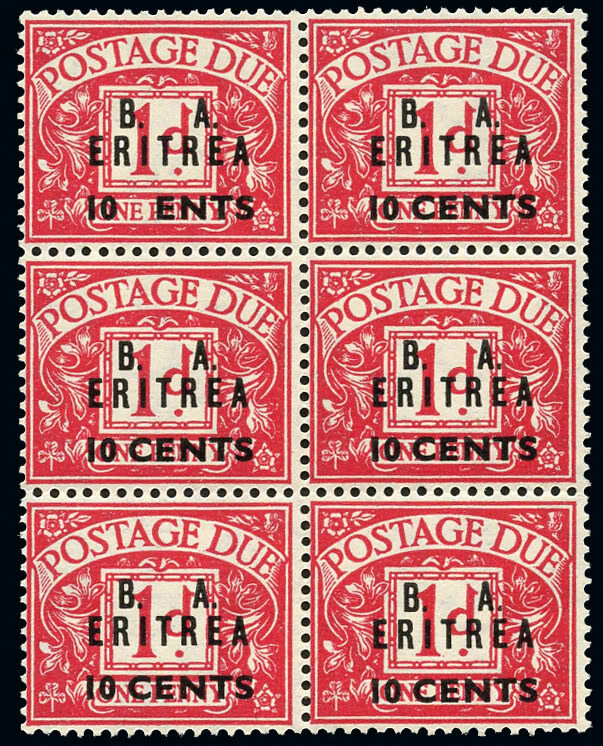 This auction had been preceded by an exceptionally diverse and attractive sale of BRITISH EMPIRE & FOREIGN COUNTRIES that produced its own excellent total realization of £857,600. Foremost among a number of important offerings in this auction was the ‘Blantyre’ collection of Nyasaland, which included three of the ‘Crown Jewels’ of this popular territory, long withheld from the market. 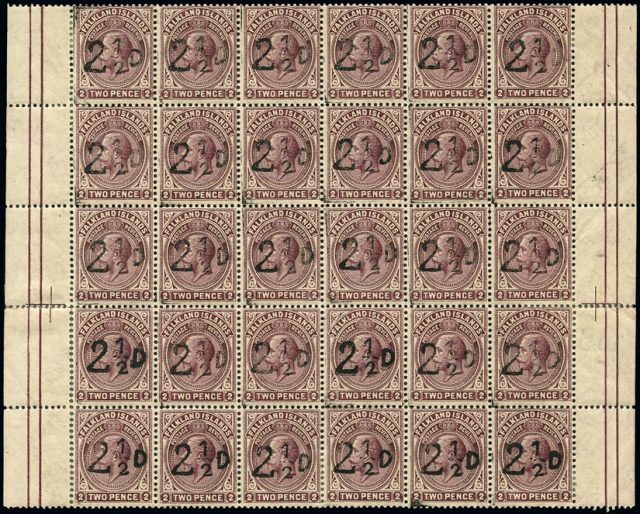 The 1898 Cheque Stamp 1d. pair showing centres inverted (S.G. 54b, lot 1143, left) had previously featured in the famous ‘Hind’ and ‘Burrus’ collections and, as the only multiple of this variety in private hands, it was not surprising for it to easily find a new owner at a price of £38,528. 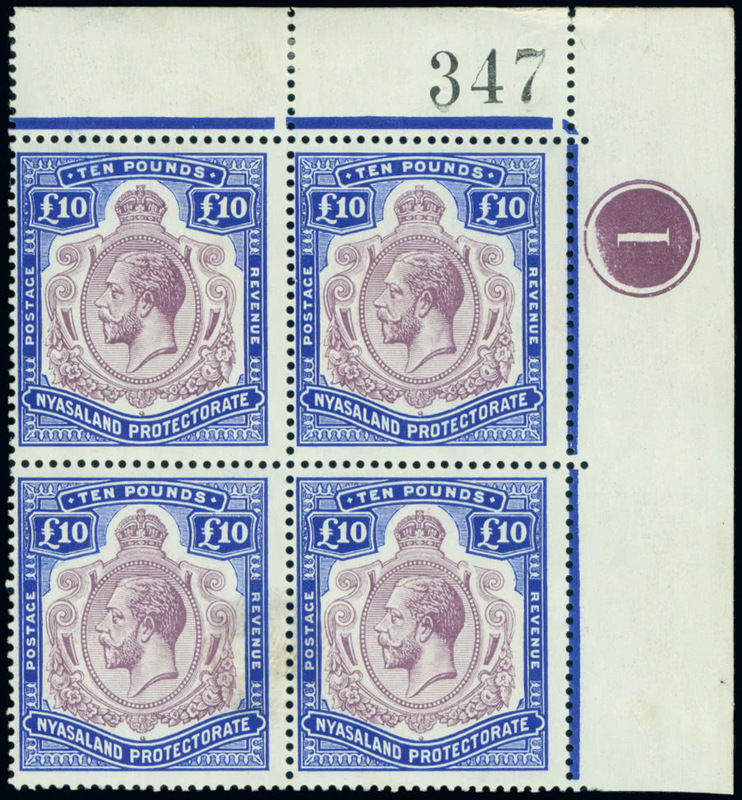 Of similar rarity, the corner plate block of four of the 1913-21 £10 that also included two major plate flaws (lot 1154) achieved £14,625, whilst the unique pair of matching corner examples of the 1907 2d. and 4d. 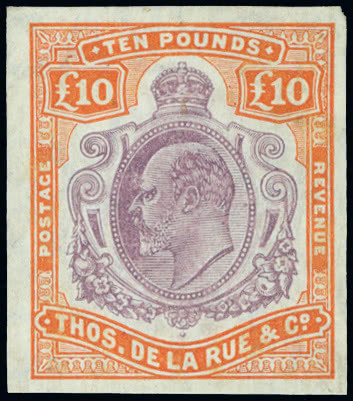 with watermark Multiple Crown CA (lot 1149) attracted strong bidding up to a final realization of £37,692. 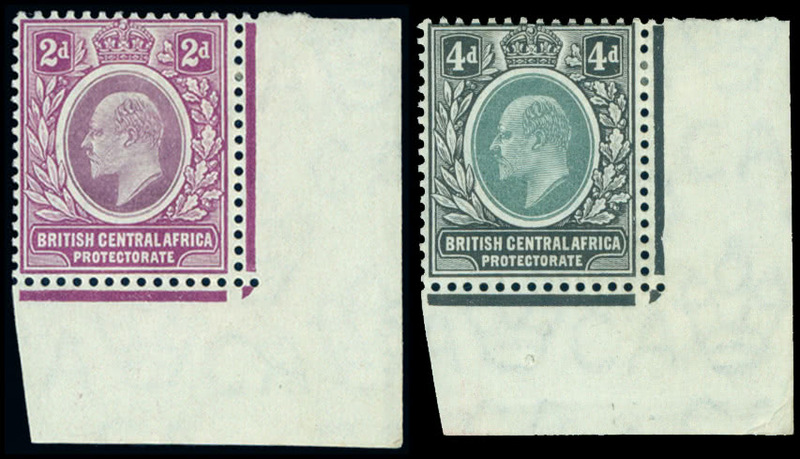 This sale was strong in British Africa with Morocco Agencies postal stationery and Uganda missionary stamps also represented in unusual depth. 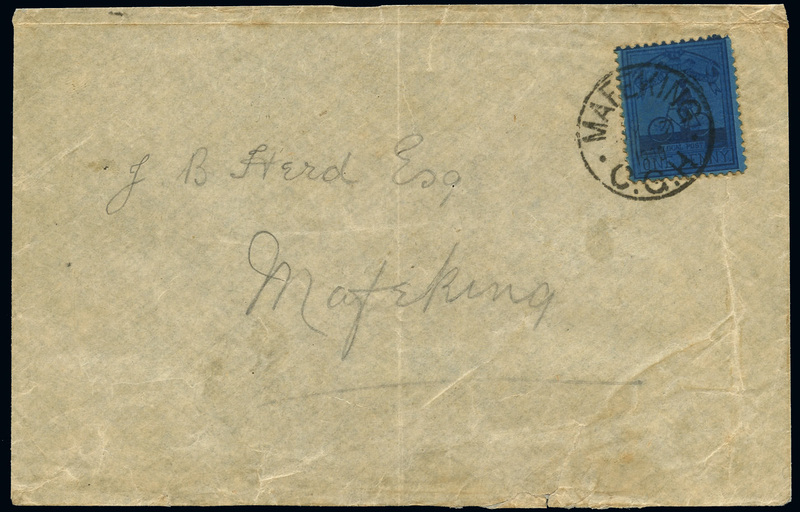 Mafeking Siege issues included a locally used envelope bearing the Sergeant Goodyear 1d. (lot 1346) that rose to £4,680 in spite of some creasing and other faults. Malaya & States featured the collection of the late Dr. Nigel Tyre and was well supported throughout. Among notable prices was the rare usage of a Federated Malay States 4c. 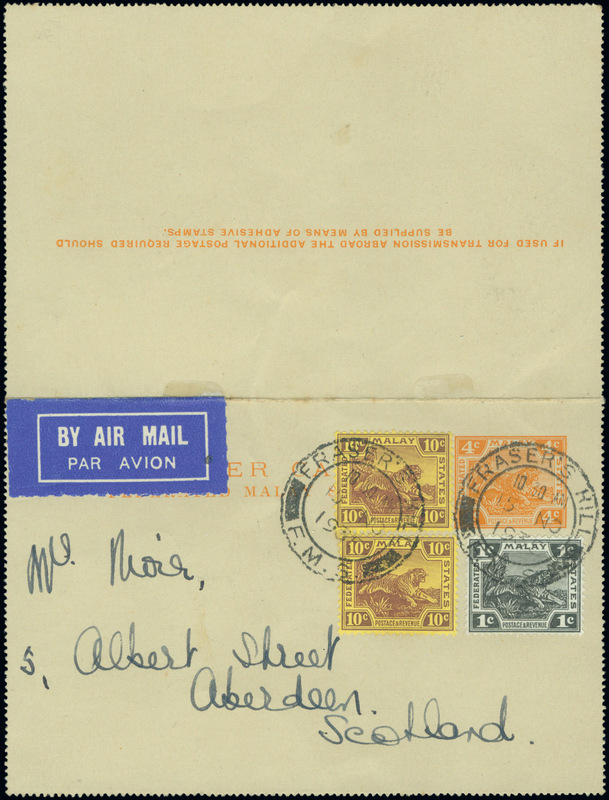 lettercard sent in 1935 from Fraser’s Hill to Scotland (lot 917) that achieved £1,987. Unusual High Value Key Plate items from the Ian Crane collection included scarce revenue documents and proofs that included a De La Rue Edward VII £10 proof (lot 102, left) produced for the Universal Colour Scheme in the colour combination later used for the Straits Settlements $500 which realised £1,324. 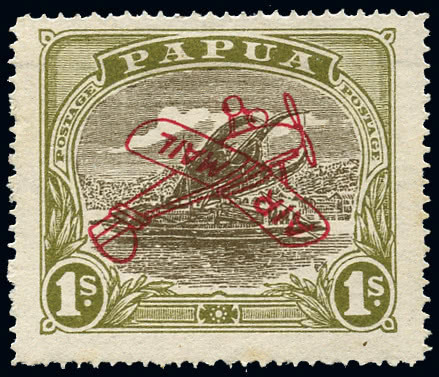 The John E du Pont collection of Papua presented several attractive rarities including a marginal block of four of the 1907 small “Papua” overprint 1s. 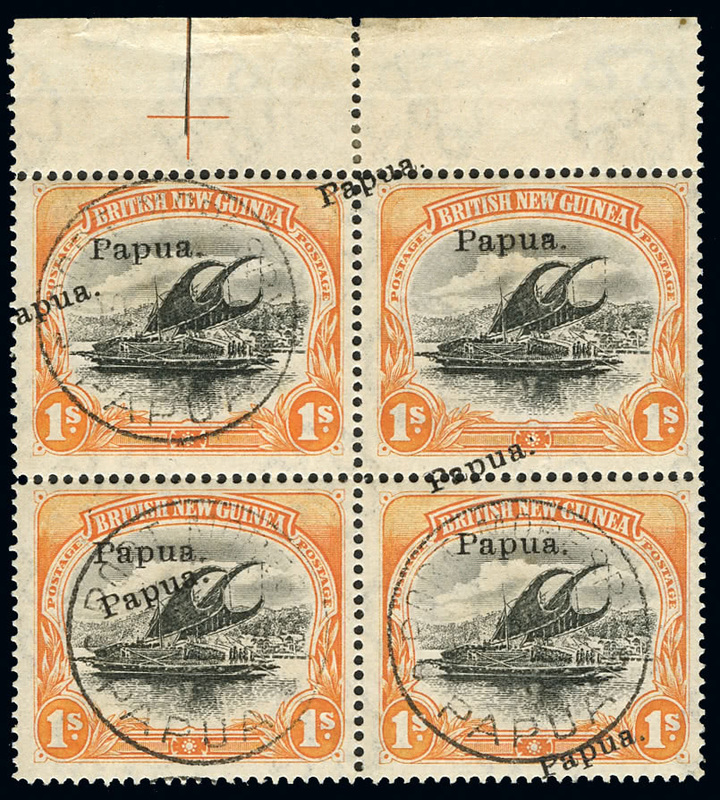 showing the spectacular overprint double, one diagonal variety (lot 1220, left) that reached £37,620, whilst the 1930 1s. with inverted aeroplane overprint (lot 1230), a popular error, achieved £7,775. 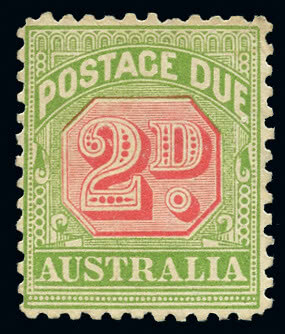 A rarely offered specialised section of Postage Dues, also from the du Pont collection, included a strong group of Australian dues amongst which the only known unused example of S.G. D74a (lot 211) found a new home for £10,530, whilst a mint block of six of the B.O.I.C. Eritrea 10c. on 1d., one with “C” of “CENTS” omitted (S.G. ED7a, lot 222), reached £3,042. Exceptionally intense bidding from around the world kept auctioneers James Grist and Andrew Williams on their mettle throughout a busy week. Prices quoted include buyer’s premium and taxes. A full listing of prices realised at these auctions may be downloaded from the Grosvenor website www.grosvenorauctions.com.